Sometimes, my dears, my worlds collide in the best possible way. And sometimes, that collided and collaborative world makes total sense. 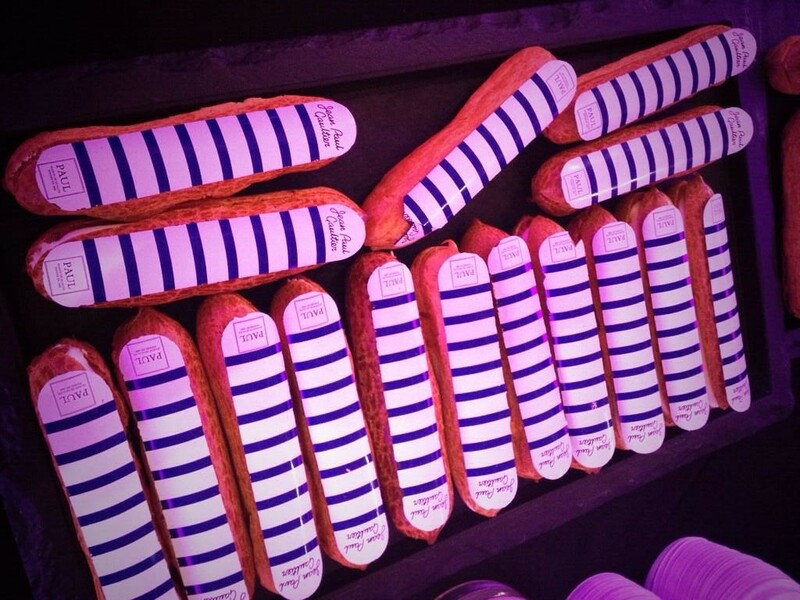 The Fashion World of Jean Paul Gaultier: From the Sidewalk to the Catwalk opens at The Barbican in London tomorrow and they had the sweetest media launch today – with Breton striped eclairs, done by PAUL Bakery (no visit to Paris or London would be the same without a treat from PAUL). Edible Breton stripes. Merci Paul. I wasn’t there in person – the exhibition has eluded me as yet for one reason or another – but am planning on heading to the Barbican before it ends on August 25th. If the stars somehow align, I might even be there for JPG’s live chat next week. Oh, and those eclairs? You can get them at all PAUL UK locations starting tomorrow. Can someone FedEx me some, svp?